PLEASE NOTE: Reminder that we are now conducting all our auctions at our spacious new gallery which is located at 2085 Dryden Road (Route 13) in Dryden, NY, just east of Ithaca. This catalog features rare, antique and decorative books as well as select additions of art and ephemera. 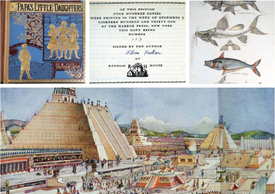 We will offer another session from the holdings of Archaeologia Books and Prints along with a substantial private collection of rare children's books and prized modern firsts by William Faulkner. Also of note is a sizable personal library of antique books relating to London and a group of original exhibit photographs by Margaret Bourke-White. Antique and rare books in this catalog feature numerous titles. Among the earliest examples are the Italian portfolio by Barriere, Falda and de Rossi, "Villa Pamphilia Eiusque Palatium," produced c1650 and embellished with engravings, the 1754 printing of Hanway's "The Revolutions of Persia," featuring a folding map and plates, and de Clarac's "Musee de Sculpture Antique et Moderne," published in 1853 in six folios with engravings. Other scarce titles include Banti and Simonetti's "Corpus Nummorum Romanorum," produced in eighteen volumes, and the 1834 landmark American legal treatise, "An Introduction to the Defence of Abner Kneeland." Several pleasing collections will also be showcased. Included is another session from the holdings of Archaeologia, concentrated in Egyptology, which is led by specimens such as Vyse's "Operations Carried on at the Pyramids of Gizeh in 1837," published in three volumes over the years 1840-1842 and featuring engraved folding plates. The private library of important Faulkner includes signed, limited editions and first printings in dust jackets of "The Sound and the Fury", "Light in August" and others. The expansive London collection is highlighted by examples such as the three-volume 1790 edition of Pennant's "Of London" with original engravings and additions, and the 1766 first edition of Gwynn's "London and Westminster - Improved and Illustrated by Plans," featuring folding color maps. Also offered is a private collection of books, ephemera and collectibles written and illustrated by Edward Gorey, including signed examples. Found throughout this catalog are interesting offerings of art and ephemera. Highlighted are original exhibit photographs by Margaret Bourke-White and original artwork, engravings and prints by notable artists such as John Caspar Wild and Edward Savage. Ephemera lots present material from categories such as antique Americana, maps, lithographs, plates, magazines and other genres.